Interested in ordering yard signs? Click here to see how it works. 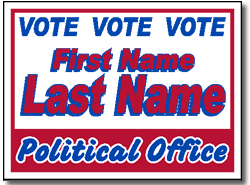 Political Signs with stands Design P52 - One Click Kit. Sign stands included. 24 x 18 political signs and sign stands. Two Color Imprint - customize with your campaign information. Political Sign Two Color Design featuring a nice drop shadow and bold name. These Political Signs are 24 inches Wide X 18 inches Tall - Made from long lasting, weather-proof 4-mil corrugated plastic. Corrugated plastic political signs are lightweight yet extremely durable. Plastic Political Sign fluting creates a plastic political sign that is very sturdy. Cheap political signs help you extend your campaign budget. Always observe local laws when placing your Political Yard Sign Two Color Design.